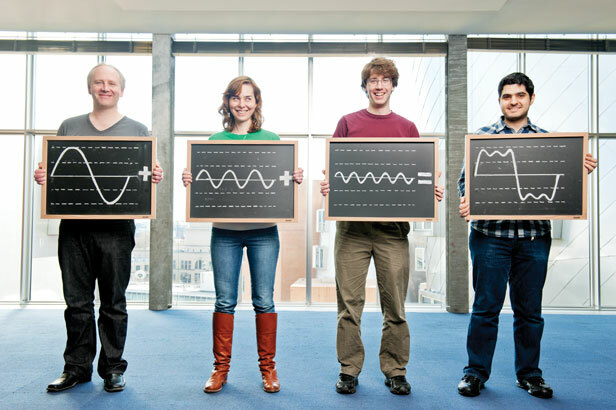 Piotr Indyk, Dina Katabi, Eric Price, and Haitham Hassanieh (left to right) have created a faster way to break down complex signals into combinations of simple waves for processing. In January, four MIT researchers showed off a replacement for one of the most important algorithms in computer science. Dina Katabi, Haitham Hassanieh, Piotr Indyk, and Eric Price have created a faster way to perform the Fourier transform, a mathematical technique for processing streams of data that underlies the operation of things such as digital medical imaging, Wi-Fi routers, and 4G cellular networks. The principle of the Fourier transform, which dates back to the 19th century, is that any signal, such as a sound recording, can be represented as the sum of a collection of sine and cosine waves with different frequencies and amplitudes. This collection of waves can then be manipulated with relative ease—for example, allowing a recording to be compressed or noise to be suppressed. In the mid-1960s, a computer-friendly algorithm called the fast Fourier transform (FFT) was developed. Anyone who’s marveled at the tiny size of an MP3 file compared with the same recording in an uncompressed form has seen the power of the FFT at work. A faster transform means that less computer power is required to process a given amount of information—a boon to energy-conscious mobile multimedia devices such as smart phones. Or with the same amount of power, engineers can contemplate doing things that the computing demands of the original FFT made impractical. For example, Internet backbones and routers today can actually read or process only a tiny trickle of the river of bits they pass between them. The SFT could allow researchers to study the flow of this traffic in much greater detail as bits shoot by billions of times a second. If I had to lay a bet as to which of these 10 "technologies" will have the most effect over the next 5 years I would put my money on this one. We are talking about sending more information with less bandwidth, and many other algorithms being speeded up by this new short cut. We are living in the age of the algorithm. This is a big deal. @ptmmac Ditto. This has immense potential, over the next 5 _and_ 50 years. The SFT could allow the massive number of criminals in the government to study the flow of this traffic in much greater detail to extract your account details, financial information, all the better to spy on you with. The evil ones will put this to use as soon as they can. @GuyFalkes The SFT would only be used for Audio and Video signals, no risk for data here. This article overstates some things. 1) mobile devices are rarely compressing... mostly decompressing (which is much easier in most cases), and 2) once you've compressed audio using something like AAC, random noise IS actually substituted for parts of the original sound. Don't get me wrong, this is a good break through, but it's use is being overstated. @tdistler Things are changing ...mobile devices *are* encoding content a lot more than ever before. And it's not just VOIP and Skype ...wifi Display is becoming de-facto. Content creation has been democratized, and the apps by their dozens, will surely follow. @tdistler It seems to me sound is compressed, so is picture and video. Also radio signals. Things like touch screen, gps, motion sensor, usb probably are using. Maybe text edge smoothing/3d might also use it. Only having a BS degree and being taught to use fourier series for solving heat transfer equations (quicker)- I'd wonder the 'pure' mathematical uses for something like this. I know that far enough along in math (bessel functions etc.) it becomes a guess at the form of the solution (2 pages to solve or ten pages depending on the guess). I'd also wonder the possible vibration theory applications- most notably persuading (for lack of a better word) resonance in systems (I like thermoacoustic devices-rijke and sondhauss, etc.). My first job was doing FFT in hardware so we could more quickly massage and sharpen the images we were getting back from sonar signals (cold war era). I'm not sure the overall data stream was "sparse" enough to use these new algorithms but it would have at least let us pick out some of the known signatures we were trying to get rid of like whales and well known ship signatures. But we would still have used the traditional FFTs because we were always worried about those "unknowns" that those dirty commies might have surprised us with :-) Of course, it sure wouldn't have hurt to have this new SFT in our kitbag because we were trying everything to tease out signals (FFT, Laplacian, etc). One of the cofounders of the company Leap Motion came up with a set of algorithms, which were magnitudes faster than anything equivalent, for extracting distance and direction information from superpositioned diffraction data received from a CCD chip -- supposedly using an evolved form of FFT processing -- Several Years Ago. Sounds like he may have reached what appears to be the same or similar result a bit sooner than these four did. I guess that "when it's time, it happens." Profound implications for MRI imaging where the FFT is the bedrock of providing spatial information prior to storing the signal in the imaging matrix. No FFT no MRI. Can someone show some real examples (details with the kind of image or music, the image size or the music sample and the processor or GPU that was used), so REAL benchmarks? And do you use compression in this technique? If so, I don't think it would be great for image deconvolution (since you will lose even more data in the image). Can someone show some real examples (details with the kind of image or music, the image size or the music sample and the processor or GPU that was used), so REAL benchmarks? And do you usecompression in this technique? If so, I don't think it would be great for image deconvolution (since you will lose even more data in the image).